Online accounting application company Sage One has spearheaded a cheeky brand campaign in Australian metropolitan centres to drive awareness and visibility for the new brand. Sage One brings a new competitive offer to the Australian small business accounting sector with dominant strengths that include low price, superior service and a powerful accounting heritage behind the new solution. “Our new ad campaign is grounded in the belief that the market needs choice and diversity when it comes to cloud based accounting solutions for the small business market, and for the accounting sector who service micro and small businesses,” said Lukas Taylor, general manager for Sage One. 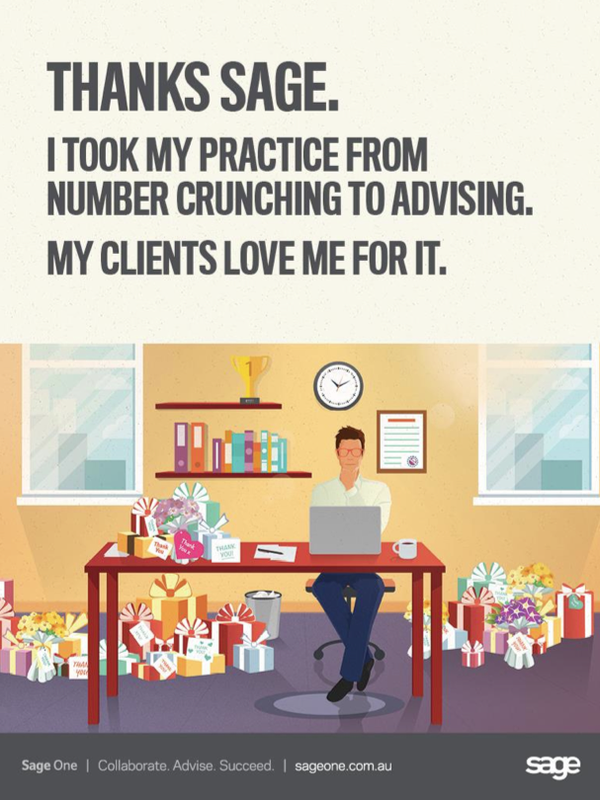 Sage One engaged award winning agency Brightlabs to help develop the brand identity with a brief that included a call for fresh creative, clever tag lines and strategic ad placements to echo Sage One’s disruptive, customer-focused brand identity. The multi-layered brand campaign is evident across multiple platforms and includes digital advertising, buses, trams, transit locations and lift placements. The resulting campaign will help to drive awareness in the highly competitive small business accounting sector in the Brisbane, Sydney and Melbourne markets. “We love to work with clients that challenge us creatively. Sage ticked all the boxes for us and they’ve allowed us the freedom to take a serious business solution and make it fun. We provided a creative solution that worked well across organic, paid, digital and print solutions,” said Rishad Sukhia, director of creative Agency Brightlabs. “The illustrative brand campaign is designed to reach two different audience groups these being small business owners, as well as the accounting practice sector,” said Elaine Seeto, group marketing manager, Sage Australia. “The small business campaign is mostly outdoor and being a relatively new player in the market, Sage One needed to achieve as broad a reach as possible for the end user market. Transit was the ideal platform for reaching these customers and catching them where they travelled or caught public transport. “For the accountant specific campaign, we have predominantly used digital branding as we need to be very effective in how we target this segment. Other aspects of this campaign includes targeted advertising in major city towers and lifts, allowing us to reach accountants in their home territory,” said Seeto. Taylor added, “When we launched Sage One earlier in May this year, the small business accounting sector effectively became a three horse race allowing us to sit in the same consideration set as Xero and MYOB. 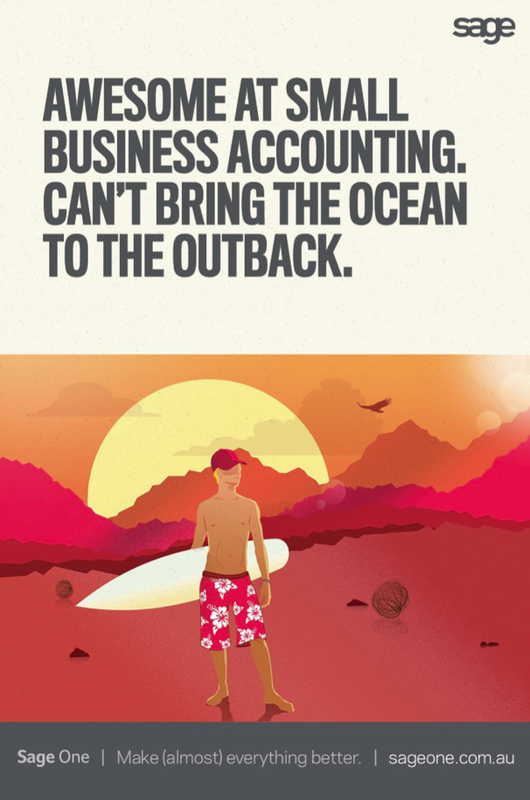 Sage has been servicing accountants for over 20 years across the world and we have taken that knowledge and expertise to create Sage One for Australian SMBs, entrepreneurs and accounting practice leaders. “The ad campaign is crafted to make the link for small business and accountants and drive market confidence and trust in our new offering. We have other campaigns planned for Sage One and the next few months will see us cross further into exciting new frontiers with our creative,” Taylor said. The Sage One campaign commenced in early July and is running through the rest of the year.